PHOENIX (Sept. 27, 2018) - Rep. Paul Gosar has been in the public eye lately, after six of his nine siblings were featured in a campaign ad by Gosar’s opponent, Dr. David Brill. Phoenix-based research and polling company, OH Predictive Insights, turned to Arizona’s fourth congressional district to gauge the effect among likely voters. Among voters, Gosar is a popular choice: 57% of voters said they would vote for Gosar, with Brill at 25%, Haryaksha Gregor Knauer at 2% and 16% undecided. 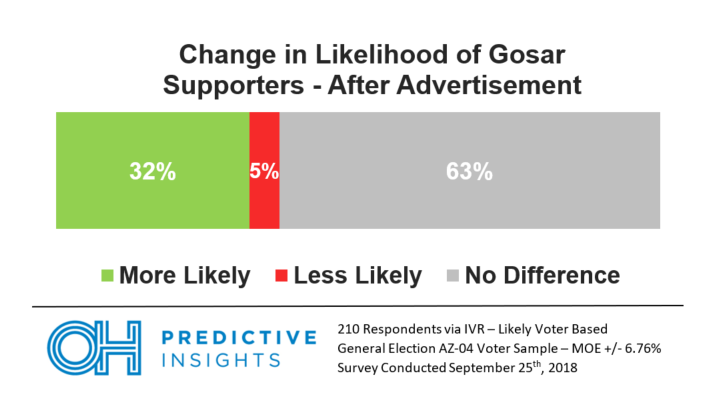 In reference to the ad opposing Gosar, voters were also asked: “Does this make you more or less likely to vote for Congressman Paul Gosar, or does it make no difference in your vote?” Among responses, 25% said the ad made them more likely to vote for Gosar, 17% said it made them less likely and 58% said it made no difference. More than half of respondents are unfazed, in spite of the opposing ad making national news. 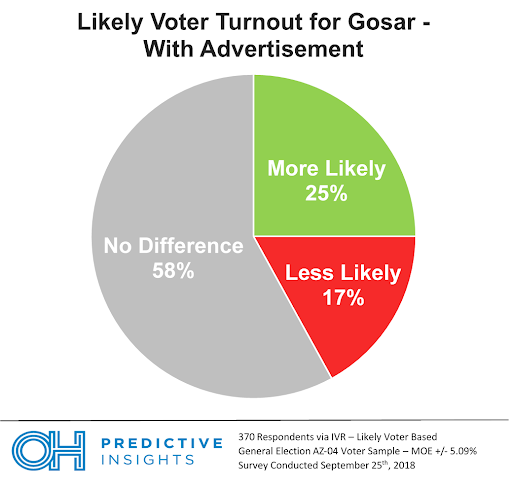 Males voting for Gosar have an even higher percentage: only 3% are less likely to vote for him because of the ad, 40% are more likely and 57% do not have a change of opinion. Now, the elephant in the room: What’s going to happen at the next Gosar family reunion? OHPI asked Arizonans how they would prefer to watch the next Gosar meetup: 15% would want to attend in person, 12% would watch it on TV, 2% would be willing to watch it on Pay Per View and 66% have no interest in watching at all. “As awkward as the next reunion will be, surprisingly most voters don’t have any interest in being a fly on the wall,” said Noble. Methodology: This automated phone poll was completed by OH Predictive Insights on September 25, 2018, from a likely 2018 General Election AZ-04 voter sample. The sample demographics accurately reflected party affiliation, gender, region, and age. The sample size was 370 completed surveys, with a MoE of ± 5.09%. Poll report for the General Election poll can be viewed here.